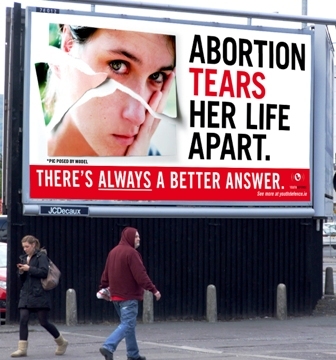 If you’ve been in Dublin recently, you can’t have failed to notice the throngs of audacious billboards and public transport ads that, well, advocate a stridently pro-life point of view, let's put it like that. In a year that will be so important for the future of children’s rights, it’s disconcerting in the extreme to see the way in which the discussion has been pivoted onto such a narrow and divisive fraction of the debate. But even more disconcerting is the fact that the image of being pro-life exists as it does in the zeitgeist. When you hear the term “pro-life”, it automatically conjures certain images, and usually those images are of fetuses on large placards, being carried by the most ardent single-issue campaigners in politics, picketing family planning clinics and challenging politicians about their stance outside Mass. And in the US it’s much more intense. But not only does the term, and those who vocally self-identify with it, construct a false duality (there are, I daresay, very few people in favor of legalizing abortion who are generally pro-death) it also falls horribly short in scope. Pro-lifers of the kind we have placing billboards seem inordinately focused on unborn babies, but once they emerge into the world, then what? This is the question we have been failing to ask ourselves for far too long, and in failing to answer it we have done our young people a serious disservice. In the last thirty years we have had innumerable schismatic debates on abortion, but what point is shouting about when life begins if we can’t provide a fundamental quality of life to our children? In this country far too many children are born to poverty, to social deprivation, to effective pariah status because of who their parents are. In this country far too many children can’t get access to a good education or the basic resources of bettering themselves. In this country far too many children are voiceless when it comes to being given a say and a role in how their communities should be run. In this country far too many children have to grow up too early. And in this country far, far, far too many children are neglected when they should be looked out for the most. Throwing up billboards is doing nothing for them. It’s easy to say you’re pro-life, but without a fidelity to tackling the problems that face our young people throughout their development then it just boils down to nothing more than emotionally charged, histrionic sloganizing. No matter what their age, children deserve much better than that.